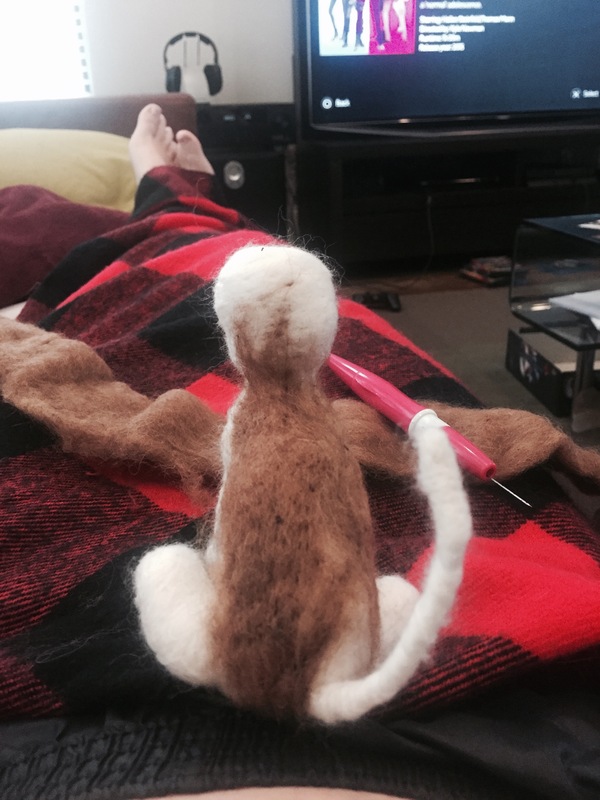 The same friend that taught me to make homemade soap in May taught me to make felted soap a couple of weeks ago. (This post is way behind!) 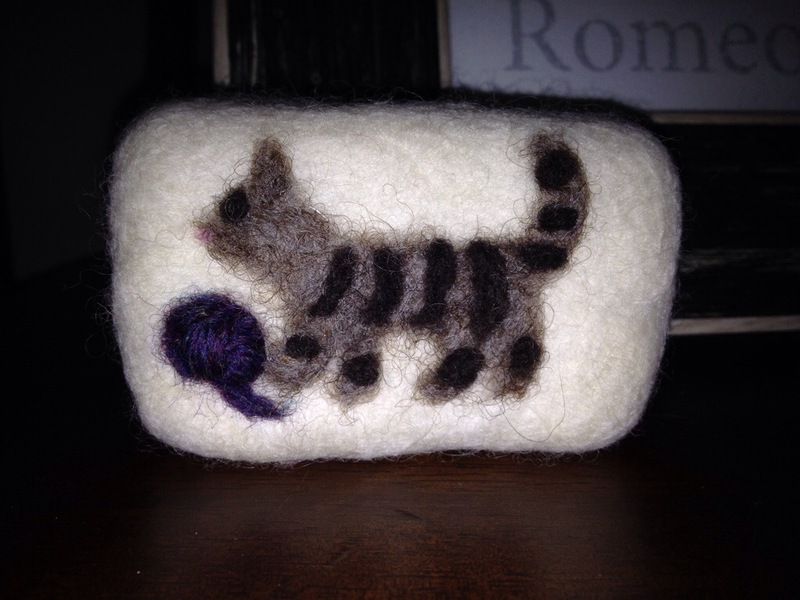 Making felted soap is actually super easy and makes a great fun, creative gift. I didn’t take picture during the process, but there are already some great tutorials on how to do it. Frugal Kiwi breaks the process up into two parts: how to wet felt the soap and how to needle felt a design on top. 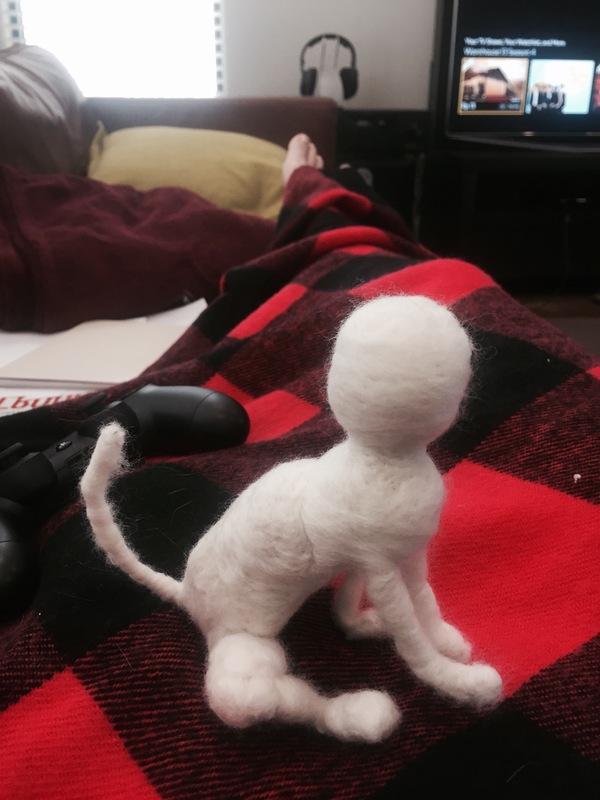 I used a piece of my friend’s amazing homemade soap, wet felted in a natural off white fiber, then needle felted a cat and ball of yarn on top. The only real variation from what Fugal Kiwi describes is that we used bubble wrap to create friction rather than a sushi bamboo mat. I had a great experience. 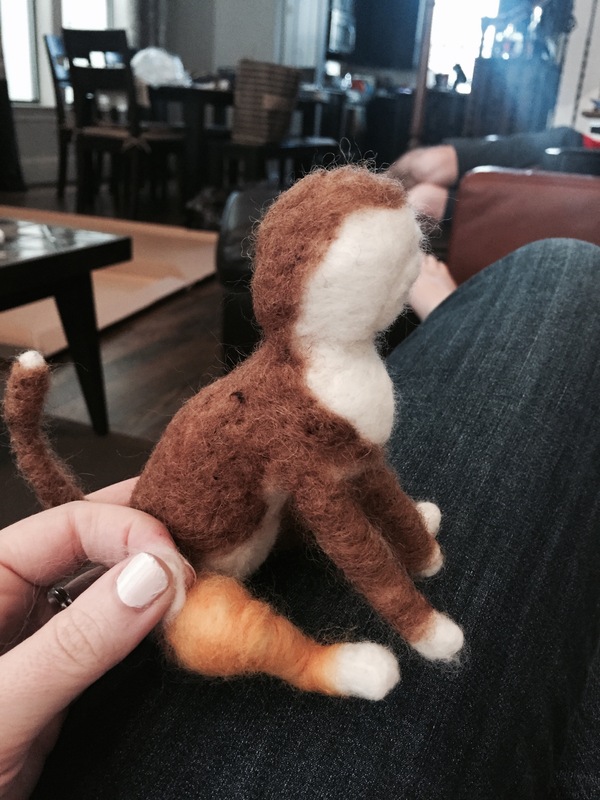 If you are looking for a new, easy craft, I would definitely recommend making felted soap! One of the blogs I follow, The Crochet Crowd, held a Mad Hatter crochet challenge. 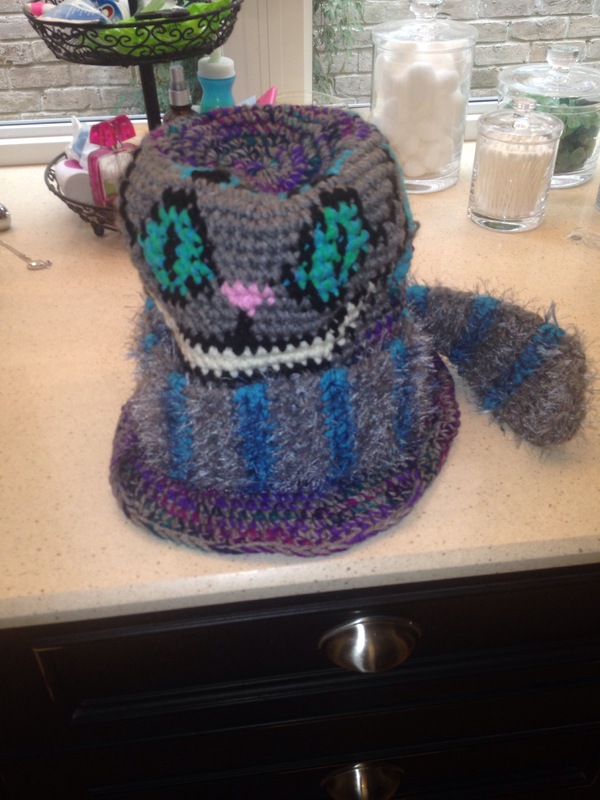 The goal of the challenge was to crochet a Mad Hatter hat following a pattern by Red Heart. 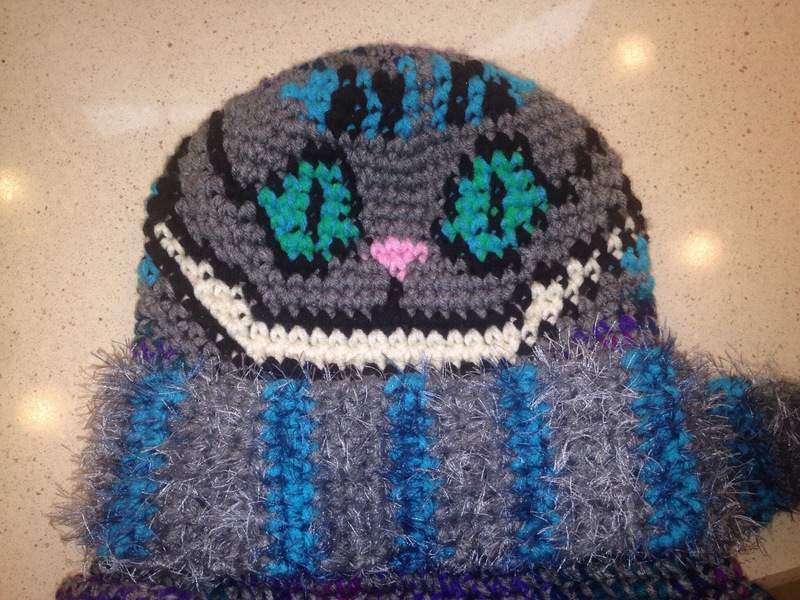 The crocheter could use any colors and decorate the hat using an Alice in Wonderland theme however he or she wished. I made two hats. 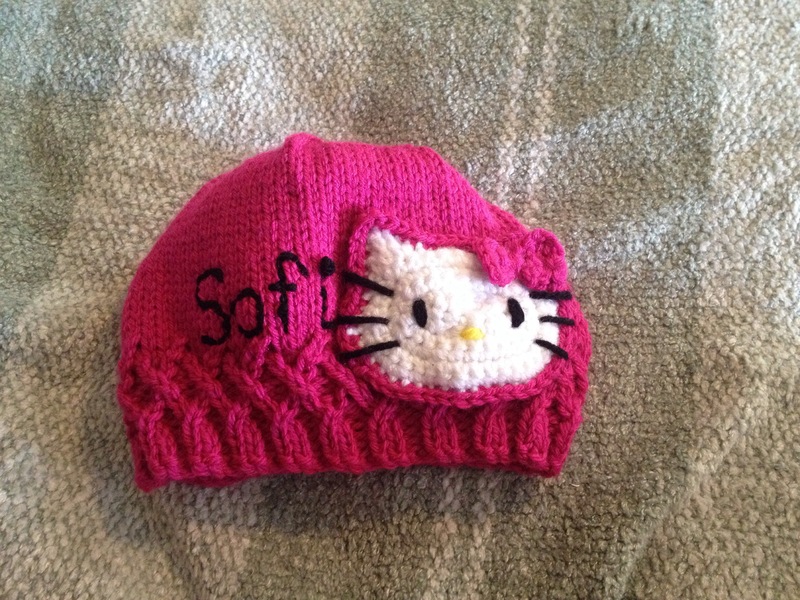 One of my coworkers asked me to make a Hello Kitty hat for his 3-year-old daughter. He wanted it to be primarily pink rather than white (white and 3-year-olds don’t mesh well). 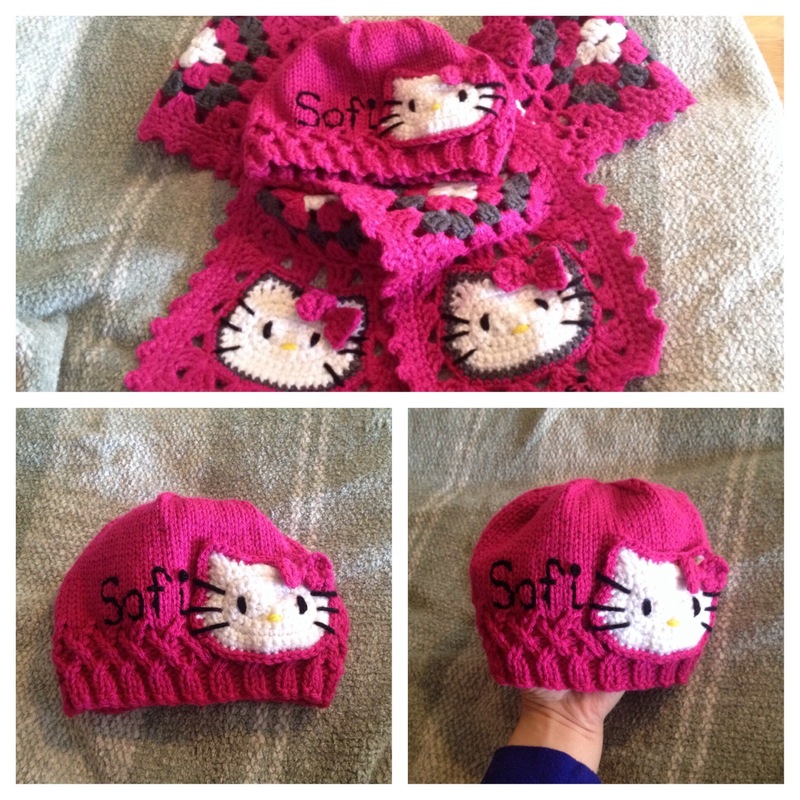 I knitted a hat and crocheted the Hello Kitty face from the Hello Kitty scarf that I made for my sister last year. I chose a lattice pattern to put around the bottom of the hat to make the hat more feminine. Afterwards, my coworker asked me to make the same scarf I made my sister. I would have incorporated some gray into the hat as well if I was planning to make the scarf from the beginning. The set did turn out really cute! Knit each following row until the hat is 5.5 inches long. Cut the yarn with several spare inches. Thread a tapestry needle and pull yarn through all 14 stitches on needles. Work in ends. Switch to crocheting with W and crochet hook. 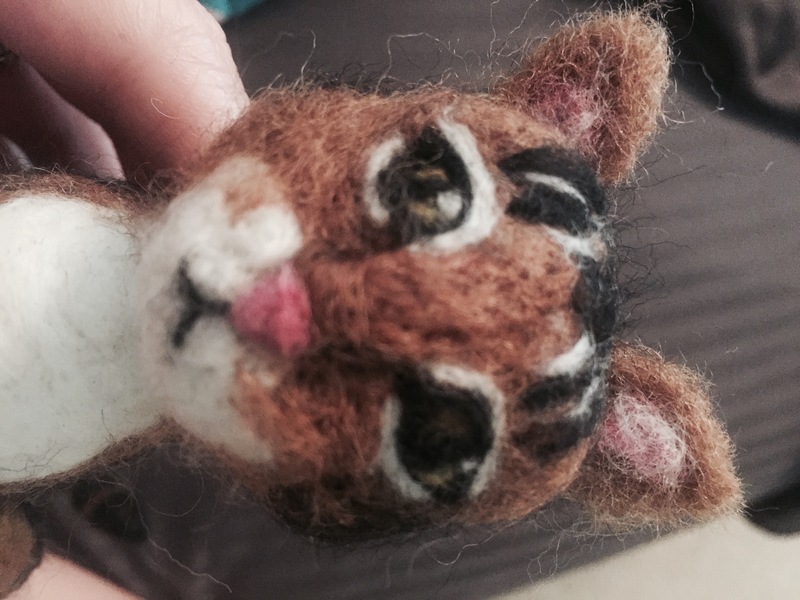 Embroider eyes and nose on face using B and Y. Modified sc (msc): When you insert your hook under top 2 loops of the stitch below, also insert it under the hat loop directly underneath the stitch on the face, yarn over, bring loop through hat loop and face stitch, yarn over and bring loop through both stitches on hook. Hold the face in place on the hat. With P, sl st to any stitch on R7 of the face, ch1, msc in same stitch. Msc in each stitch on face except trc, place 3 msc in each trc, after completing all msc, sl st in first msc. My 15-year-old sister is OBSESSED with Hello Kitty. 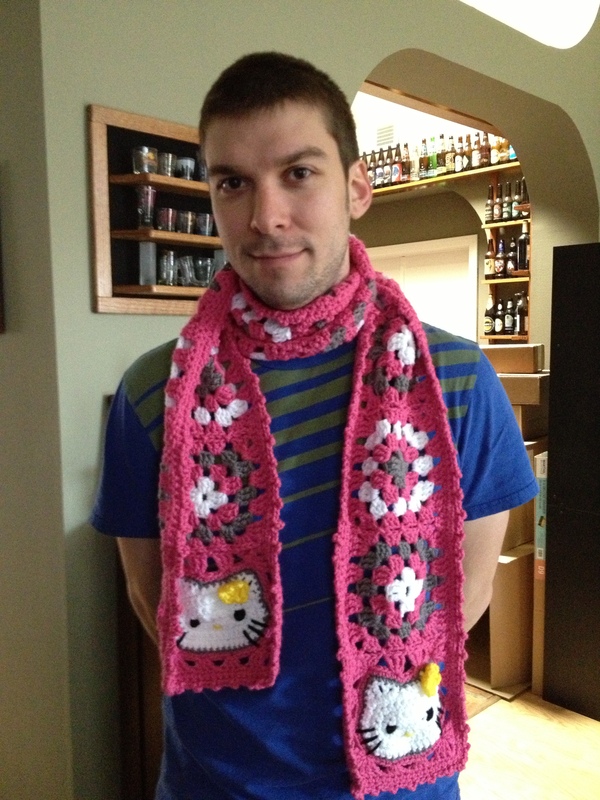 When I stumbled upon a crocheted Hello Kitty scarf on Pinterest, I knew that was going to be part of her Christmas present. The pattern was written by Made by K. The pattern is quick, easy, and looks just like Hello Kitty. The only drawback is that it is very long. Karin of Made by K included multiple sets of alternate instructions for different parts of the scarf. I found this fun because I had choices, but others might find this confusing. Karin made her scarf for a child and included seven regular granny squares (four white center and three grey center). Since my scarf was for a very tall (5’10ish) teenager, I made 11 regular granny squares (6 white center and 5 grey center). There are several methods for joining the granny squares. I used the join as you go method described in the pattern. Karin gives easy border and harder border instructions. The connected squares tend to dip in where they are joined (see picture below from Karin’s blog). After completing the first row of the harder border, which is supposed to give a smooth border, my project was still dipping in at these locations. (I wasn’t planning a blog at this point or I would show pictures.) I accounted for this in Row 2 of the border. Row 2 asks the crocheter to single crochet all the way around the scarf. 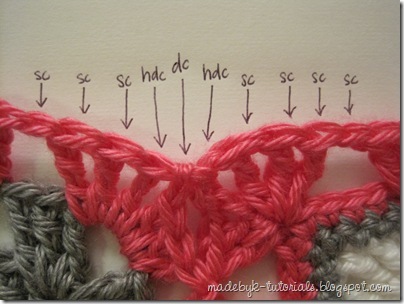 I followed this except I half double crocheted in the double crochet stitches from Row 1 (see picture below). I added the flower detail to both Hello Kitty squares instead of just one. Here is my (almost) fiance (at that time) modeling the scarf. It really brings out his…something. My sister loved the scarf. She modeled it with all of her other Hello Kitty Christmas items. The pattern may be a little hard to follow since it is quite long. My fiance loves his cat. I’m not so sure that he doesn’t love her more than he loves me. 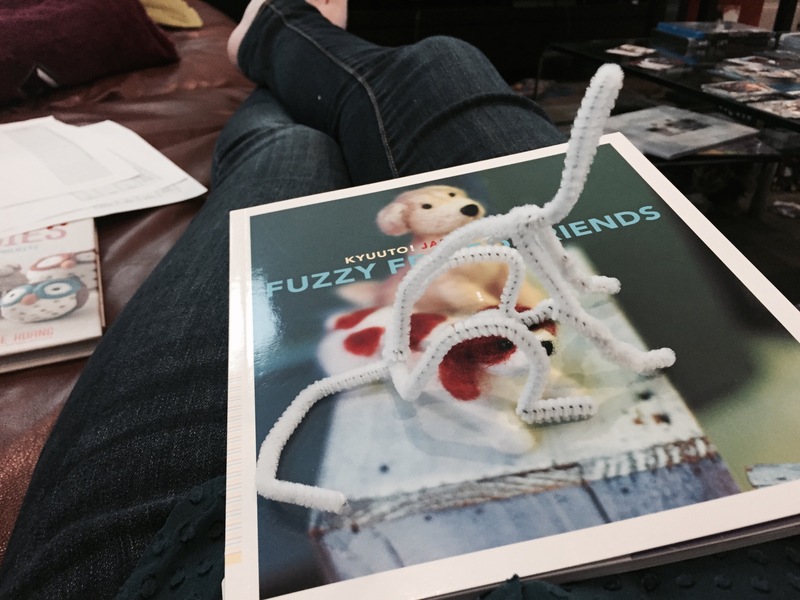 A couple of months before his birthday I stumbled upon a book on Amazon, Knit Your Own Cat. The cat featured on the front cover even resembled his cat, Kittyface. I purchased the book. 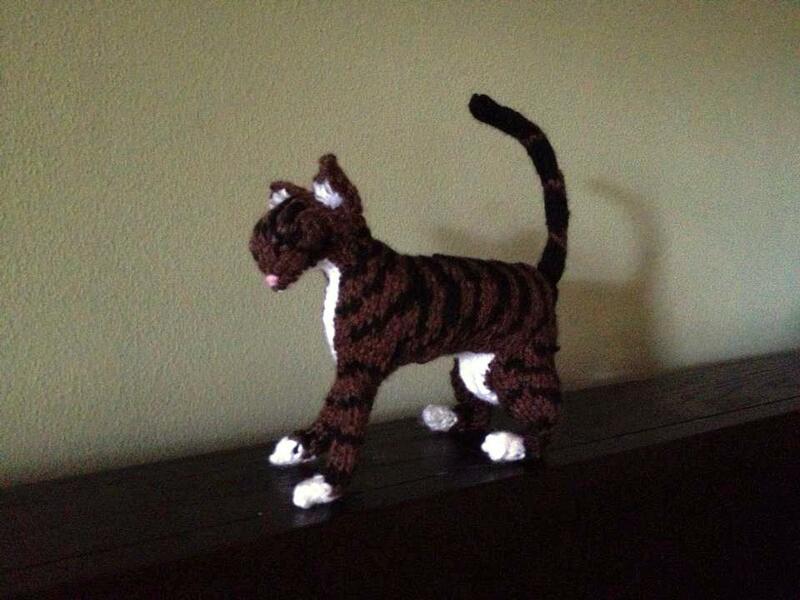 Being an avid knitter, knitting a small cat looked like it would be a quick, easy project that would amuse my fiance. When the book came, I was disappointed in the pictures of finished cats that I saw inside. The instructions called for the knitter to knit each piece flat and then sew all of the pieces together. 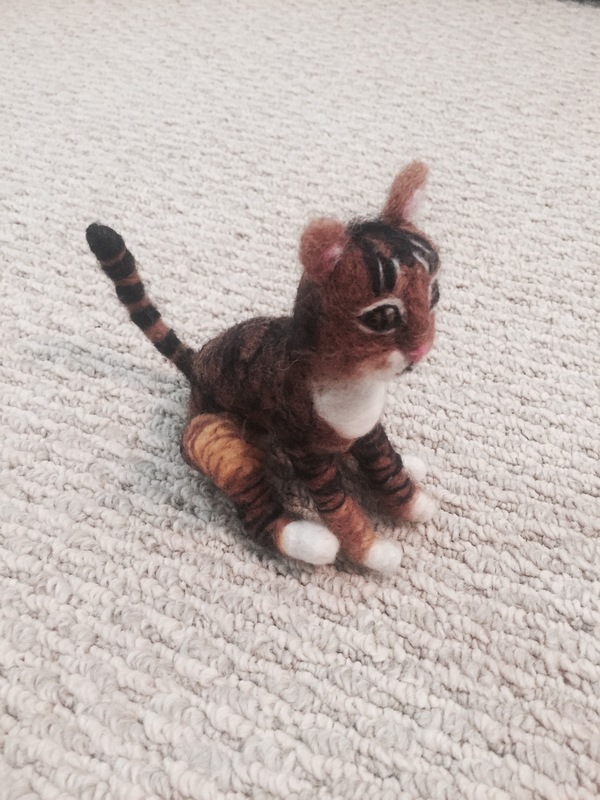 Not only does this increase the amount of construction time, but it also resulted in unsightly seems along the backs of the legs and down the center of the cat’s back. I made many alterations as detailed below. The finished project turned out really cute! The knitting itself was simple. 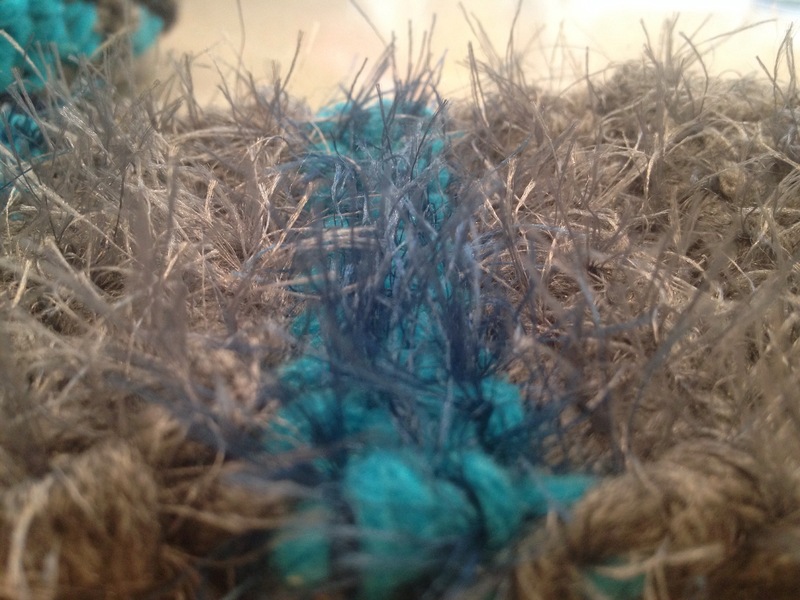 A stockinette stitch was used for most of the project. 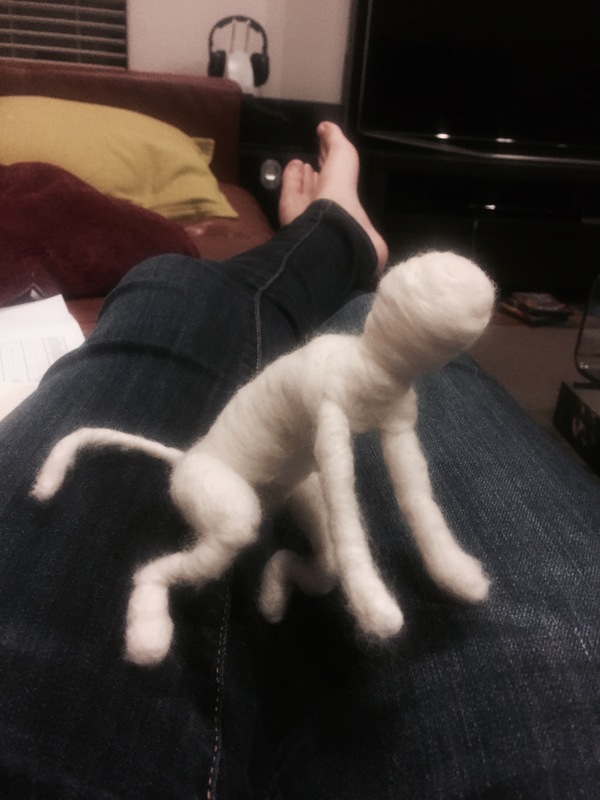 However, the cat was knit extremely tightly on tiny needles, which made the knitting more difficult. 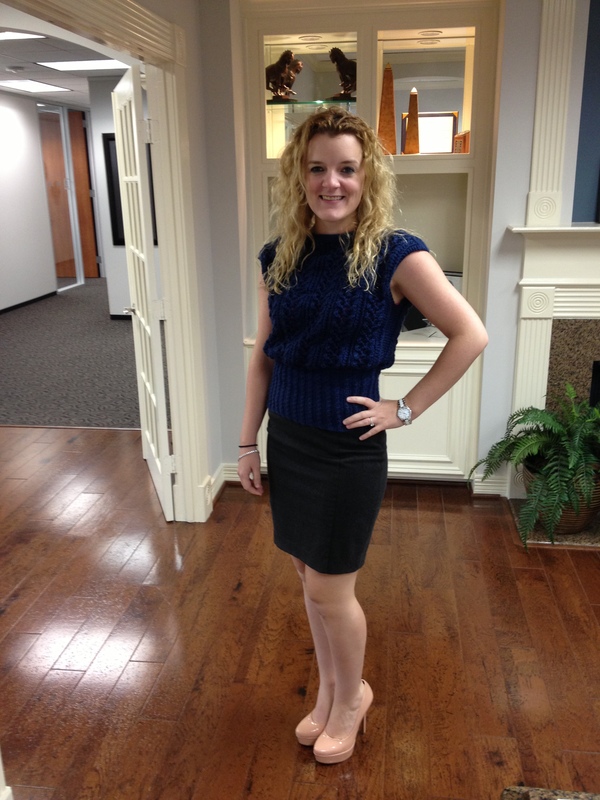 There are many color changes that require a lot of attention. 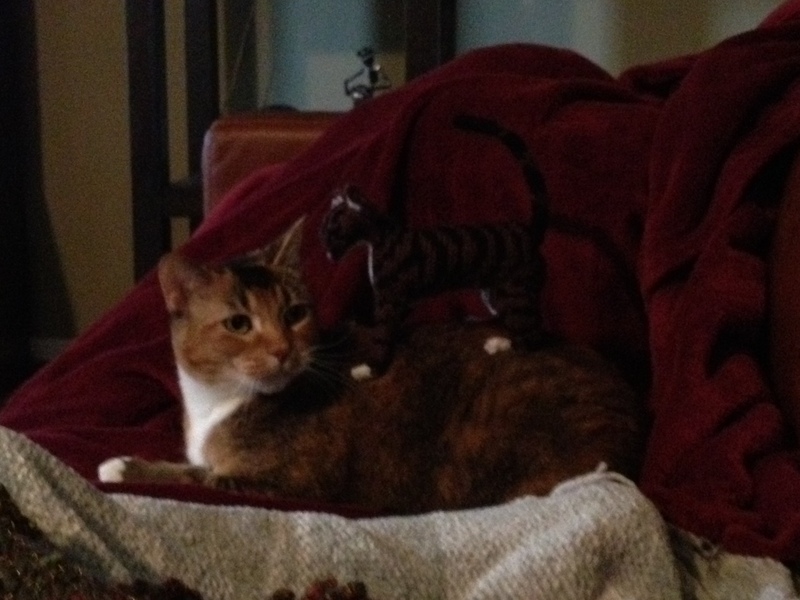 The construction of the cat is rather time consuming and difficult. The product turned out very cute. I would only make it as a gift for someone I know would really enjoy it. 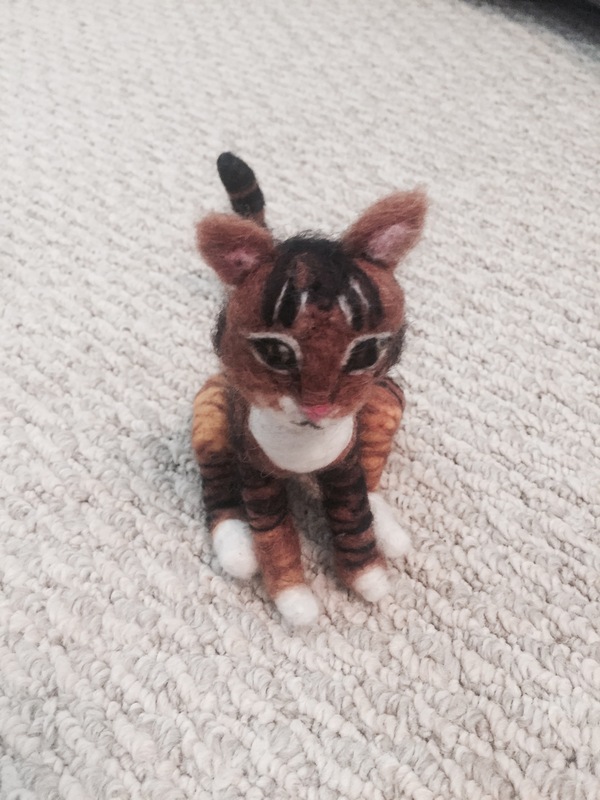 Someone offered me $20 for the cat. I wasn’t willing to part with it for that price! The pattern is copyrighted, so if you are interested in creating the cat above, please purchase the pattern and follow the alterations detailed below. 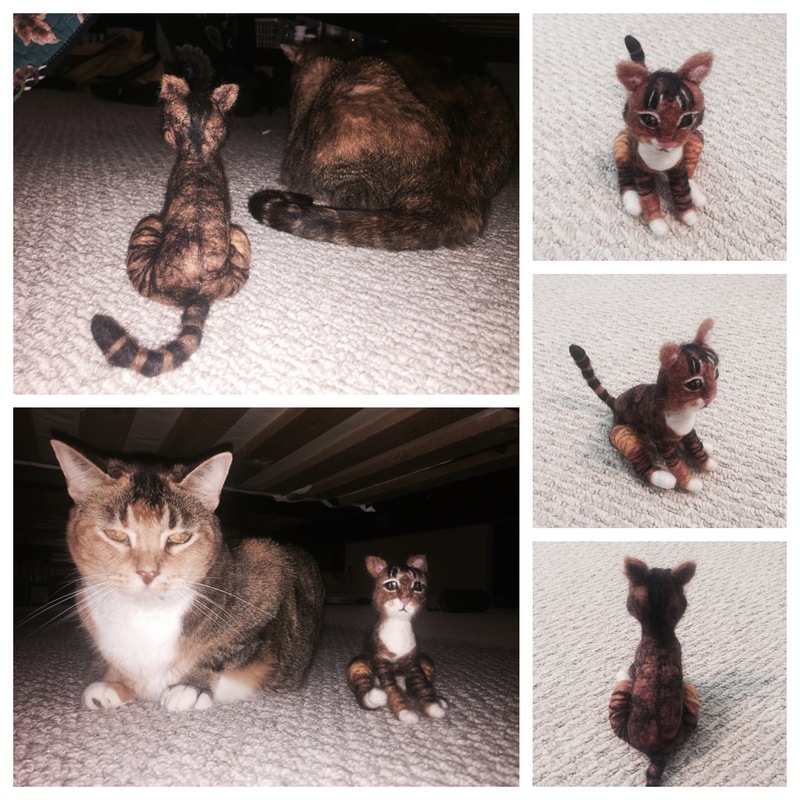 This is for the pattern “Tabby Cat Prowling.” I do not include pictures of the steps because I decided to start this blog after finishing the cat. 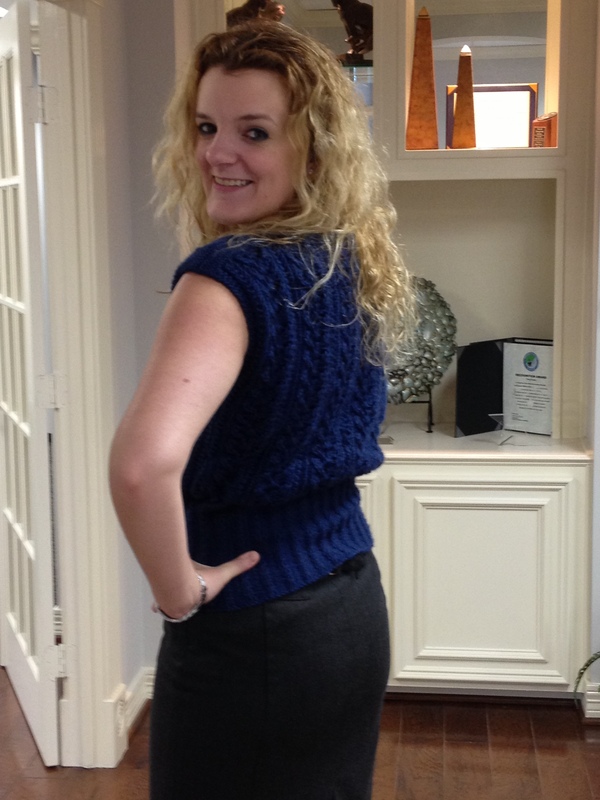 Legs: Knit the legs in a round rather than flat using double pointed US 2 needles. To accomplish this, follow the directions as written for each odd row. For the even numbered rows, knit rather than purling and follow the row backwards. This removes all seams from the backs of the legs. Side of Body Pieces: I made the side of body pieces as they were written in the pattern. Later during the finishing phase I used a revised Kitchener stitch detailed by Anonyknits. 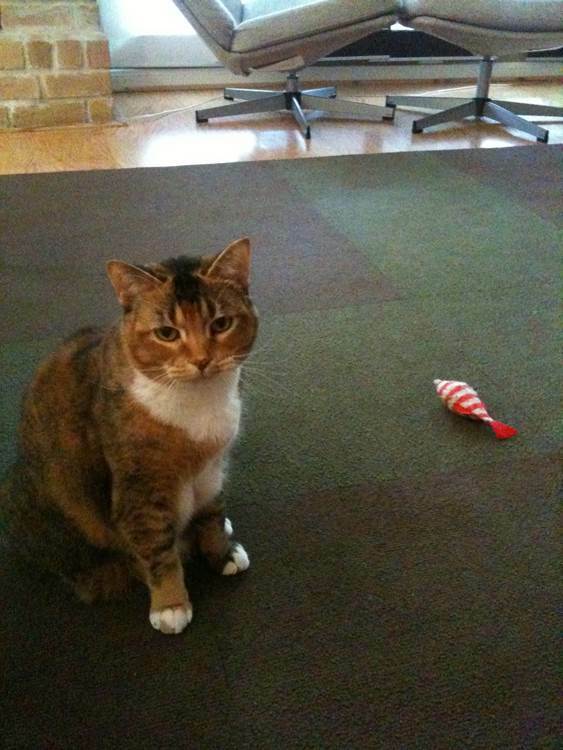 This resulted in losing some of my body stitches and a slimmer cat. If I were going to make the cat again, instead of binding off stitches along the top of the body, I would leave the stitches on an extra needle and use the actual Kitchener stitch. Tummy: I knitted the entire tummy white to match the coloration of my fiance’s cat. 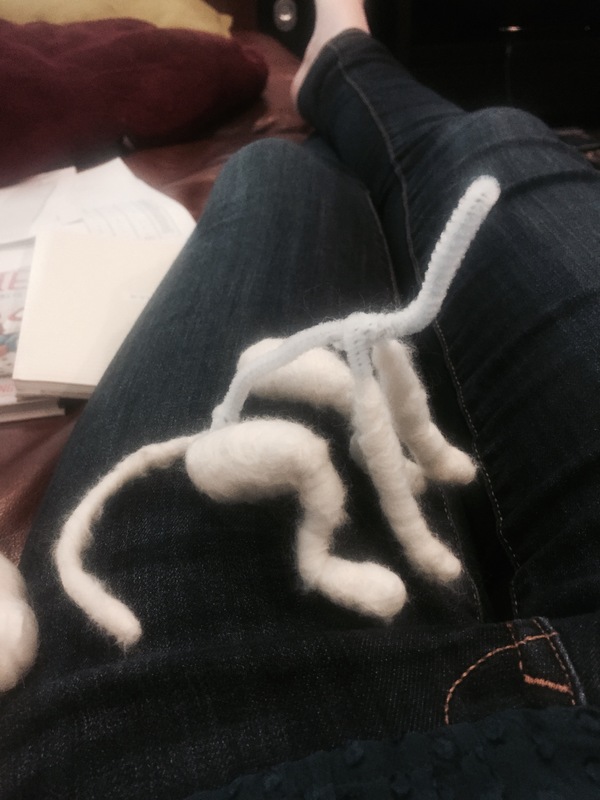 Finishing: Since the legs were knitted in rounds, they do not need to be sewn. 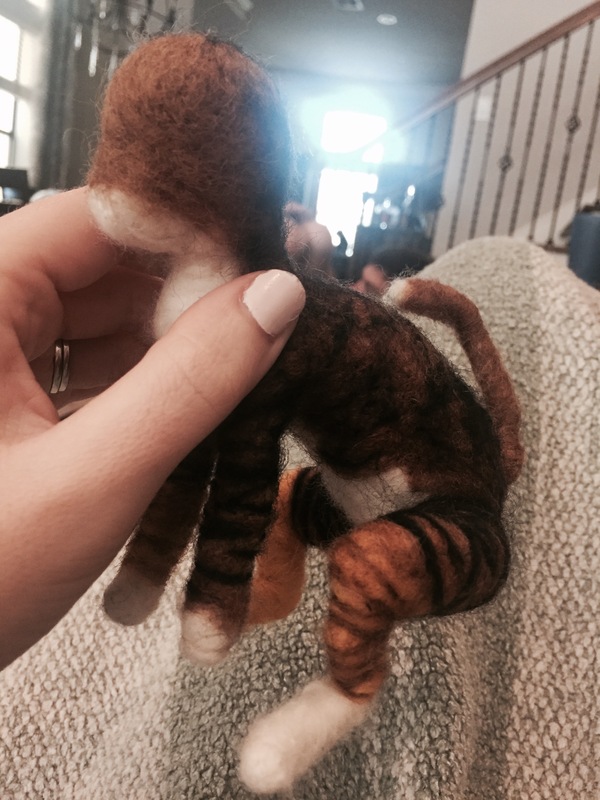 The directions tell you to embroider the face after sewing the cat together, but obviously that need to be completed before construction of the cat. 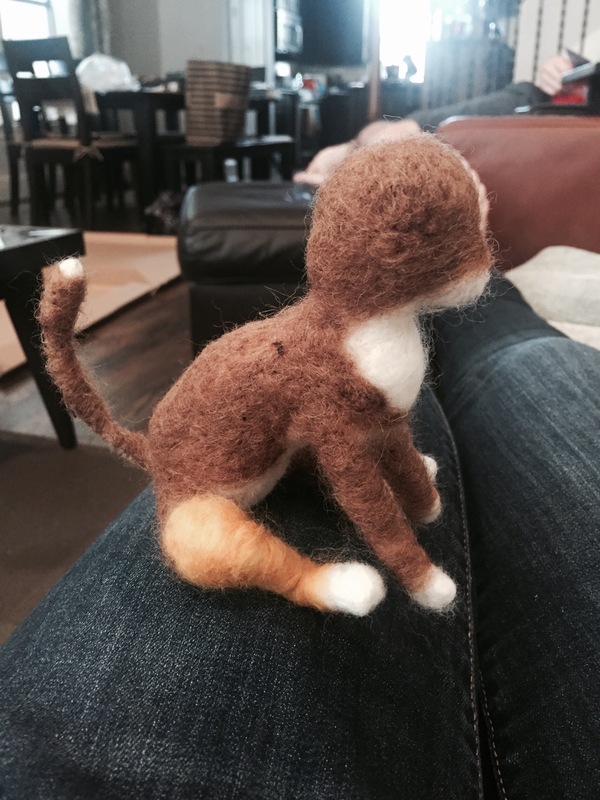 The cat should be sewn along the back as mentioned in the “Side of Body Pieces” section.